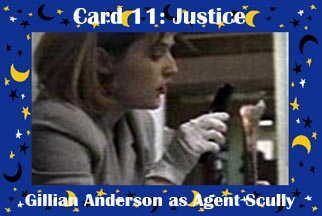 Agent Scully picks a bone to discern its truth. Justice is not blind. She sees everything, objectively, analytically. She is not involved in determining "right" or "wrong"--she leaves that to the Judgement card. She is interested only in perceiving Truth. Between government plots, alien infiltration and her partner's paranoia, Agent Scully is constantly bombarded by deception. But she has the ability to always see the truth hidden amidst the lies. Scully and her bone were dug up from Gillian Anderson Photo Gallery.